I have had a great time working with 5th and 6th graders for two weeks this month. Kids College makes up some of the favorite weeks of my summer. I mean, after all, when a giant trebuchet is involved, it’s hard not to get excited. 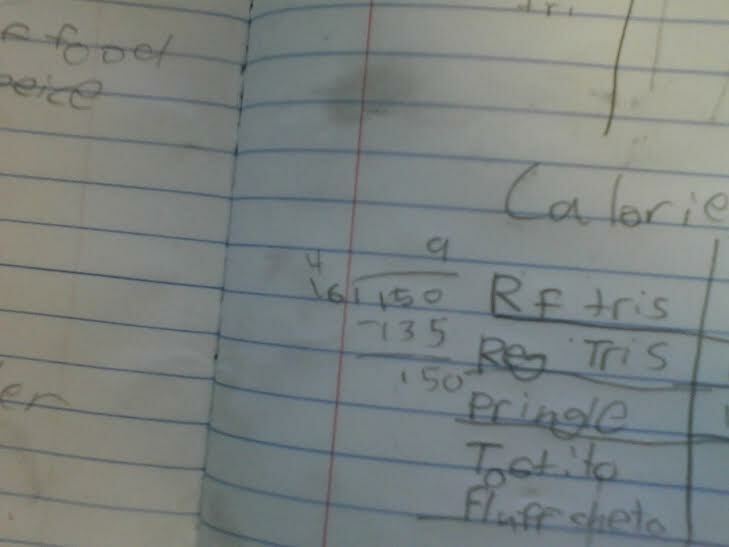 But an interesting moment occurred when I looked over a student’s shoulder to see what was in their lab notebook. Here’s what I saw. See it? It’s significant… You know what? I’ll zoom in. There we go! See that? 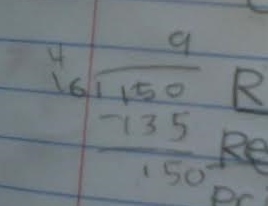 That is a straight-up attempt at long division. This might seem mundane and ordinary, but let me tell you why this grabbed my attention. That student is trying long division. What does that mean? Fast forward that fifth-grader about… mmm… 6 years. Now suppose they are learning this. This is, give or take, halfway through Algebra II. Now, I have seen firsthand that this isn’t the easiest skill for a lot of students to master, especially just as it is introduced. In fact, I would go so far as to say that there are plenty of student’s who successfully complete Algebra II while never mastering this particular skill. There are a lot of reasons that students might not master this skill, one of which might be that THIS is typically the type of situational math problems that this skill gets applied to. But the one that I have heard mentioned to me with the most enthusiasm is that schools are starting to move away from teaching long division. And that division of polynomials is much more difficult to teach to students who haven’t been exposed to long division. Fair enough, except I have a couple of thoughts. First, (and I’ll admit that this is a little off-topic) even if we assume that the struggling Algebra II students weren’t ever taught long division, what grade do you suspect they should have been? 4th or 5th grade, maybe? It just seems to me that any essential skill that was academically appropriate for 10-year-olds could very well be taught to 17-year-olds. I don’t see any reason to believe that long division is a skill with a window of opportunity to teach that is open to 10-year-olds, but has closed by the time students reach upper adolescence. Well, I assure you all, that practically every American middle schooler has been in a math class that has covered the necessary skills to make change or balance a checkbook. Just like we teach European geography, basic grammar, and the names of the Great Lakes. But not every student learns it. And whose to blame? I don’t know, but as a teacher, there aren’t a ton of folks giving me the benefit-of-the-doubt these days. We should, at least, be able to expect it from the person who teaches down the hall, down stairs, or in the building next door. … especially if that isn’t the issue. Because what happens when we make sure that every fifth grader coast-to-coast is taught long division and 6 years later, coast-to-coast, the 17-year-olds are still unfamiliar with it? I like working with teenagers for a lot of reasons. One such reason is because it is usually quite easy to get bold, absolute statements out of them. For example: “I don’t get ANY of this.” (emphasis not mine…). It’s tricky business handling that statement because most of the time, the author of that quote genuinely feels that way. That doesn’t make the it true, but if he or she is already feeling like all the attempts at math are turning up wrong, combating their perception by simply saying it’s false is probably not the best approach. See it? He made the same mistake twice. Which, as I said above, couldn’t be farther from the truth. Those two answers show quite a lot of understanding, actually. There is a single mistake that led to incorrect response in both cases. That student was unable to distinguish the shorter leg from the longer leg. That’s it. Fix that and the answers get better. At least I know that going into the discussion. Now, if I can just convince them that understanding is a spectrum more than a light switch. Dan Meyer is currently leading a very engaging #MTBoS discussion regarding “Real World Math” and it’s effects on student engagement with respect to completing (with quality) mathematical tasks. In general, “real world” is a term describing a task that attempts to emulate a task that might actually happen to someone in a non-school setting. The prevailing thought in many circles is that as a mathematical task becomes more “real world” it will become more engaging to students. Many of us have plenty of anecdotal evidence to challenge that generalization. Enter the “fake world” math tasks. “Fake World” is a term used by Meyer to describe mathematical tasks that are engaging to students and encourage/require authentic mathematical problem-solving, but doesn’t attempt to emulate any actual action or task that one might use in a non-school setting. The Magic Octagon is an excellent example of a “fake-world” task. This is not a task that would EVER be asked of you in your family, work, or spiritual lives outside of school, but it is worth 20 good minutes of almost 100% engagement in a geometry classroom. These types of experiences cast doubt on the presupposed direct relationship between “real world” and student engagement. As part of this, Mr. Meyer is attempting to do a bit of data collection to get a sense of what fake-world math activities we find engaging in our free time. For me, it’s Flow Free on my iPad. I’ve seen this wonderful little logic game draw in 31-year-olds (my wife and I), high school kids (in my classes), and my 4-year-old daughter can get lost on it for an hour straight if I’d let her. The task of a game is fairly simple. There are exactly two dots of each color on a grid. The goal is to connect each dot to its corresponding dot with a path that doesn’t intersect any other path. Also, each square on the grid needs to have a path going through it. No empty boxes. At this point, you can either try again to complete the same puzzle in fewer moves or move on to the next puzzle. 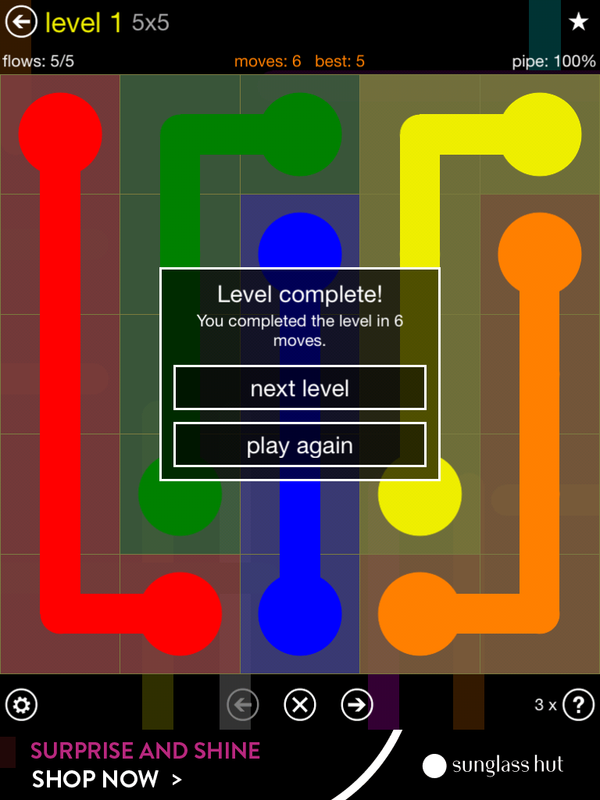 As you might expect, the puzzles get progressively more difficult with additional colors added and the grids increasing from 5 X 5 to 6 x 6 and 7 x 7. But what is it about this game that is so engaging? The simplicity of the goal is a start. It takes very little explanation to begin playing. Also, the first couple of puzzles are quite easy to allow you to get the hang of the game. The progressively more difficult puzzles is helpful as well. As you play, you start to develop some strategies and thought processes that you want to take for a spin on some harder puzzles. This game makes sure you get that chance. Also, I like that the game has unlimited do-overs. If I had to do some guessing-and-checking to complete a puzzle and I want to start it over again, I can do that an unlimited number of times until I am happy enough to move on. Or I can move on right away. It seems like those qualities could be integrated into math class. Consider an activity with a low entry point, a simple goal, some do-overs offered, and additional pieces that make the problem more difficult once the easier “levels” are solved. That would require us who design activities to take a more inductive approach to building engagement models. Look at what is engaging and see what elements they have in common. I would absolutely encourage everyone to get involved in Mr. Meyer’s conversation. Do you have a “fake-world” math activity that you find engaging? Head over and tell the MTBoS about it in the comments. A conversation was taking place over at Dan Meyer’s Blog (http://blog.mrmeyer.com/?p=17964) about proofs, which is a topic that I find myself faced with about this time every year. This isn’t a new conundrum for me. I’ve been working for while now trying to make this idea of proof, which, when compared to the typical form of textbook Algebra I should be an easier sell. But it just isn’t. Here are some discussions of my previous attempts to sell it. Posts from Nov 2, 2012, Nov 16, 2012, Dec 7. 2012 are a few examples of my thoughts from around a year ago when geometry hit this place last year. The problem I have is that the academic norms seem to prefer deductive reasoning to inductive and use of the theorem names. Those two things seem important to decide on before starting the journey of proof. If you are going to prefer deductive measurements, it rules out using measurements in proofs and it requires a lot more formal geometric language. In order to breathe life into the topic, from the experience I’ve had, you need to let students engage in ways that make sense to them at first. The target to start the process is simply to get them comfortable with the idea of designing a functional persuasive argument about a mathematical situation. This requires recognizing that they need to start with a clearly stated claim (preferably something that is provable) and then start supporting it. I find it helpful to let them pull measurements from pictures first and use those in the proof. The idea of comparing two things by length and NOT measuring them to get the length seems to a lot of kids like we are making the math difficult simply because we want it to be difficult. If they sense there is an easier way to solve a problem, then the explanation for why that method is against the rules had better be very strong, or else buy-in is going to suffer some pretty heavy causalities. Once they get the hang of making an argument, then we can start by having discussions about what kinds of evidence are more compelling than others. This is usually where the students can figure out for themselves that each piece of information needs its own bit of mathematical support. 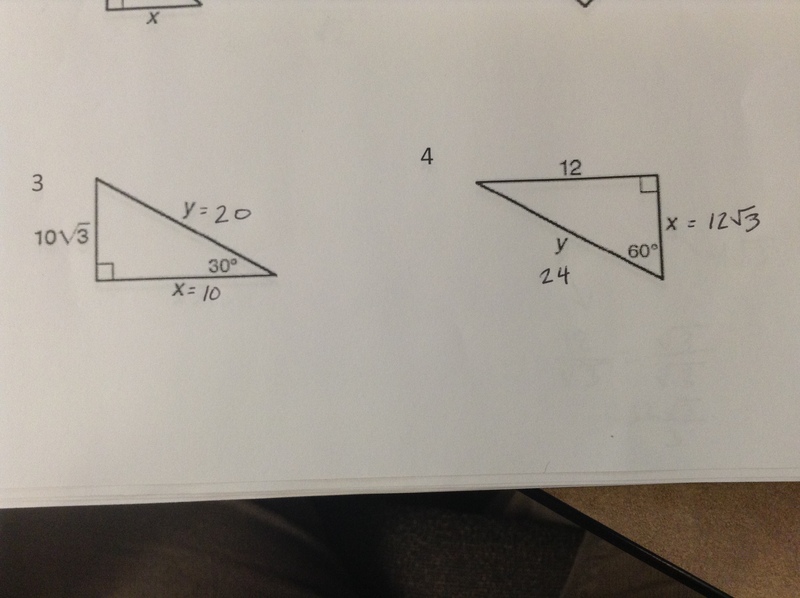 Do we really need to keep going to find the three pairs of congruent angles? 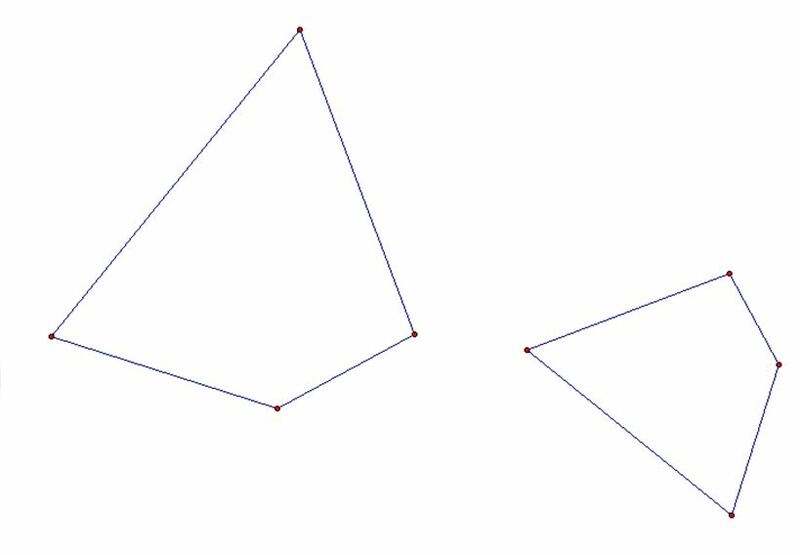 … where we standardize the side lengths of two different triangles and see how many different triangles we can make and in what ways they are different. Now, the tougher question is whether or not you allow the class consensus following the “Straw Triangle Activity” (which was a gem that came out of Holt Geometry, Chapter 3) to count as proof of the SSS theorem. In an academic sense, now we should “formally prove” SSS theorem. To most of the students, it’s settled. 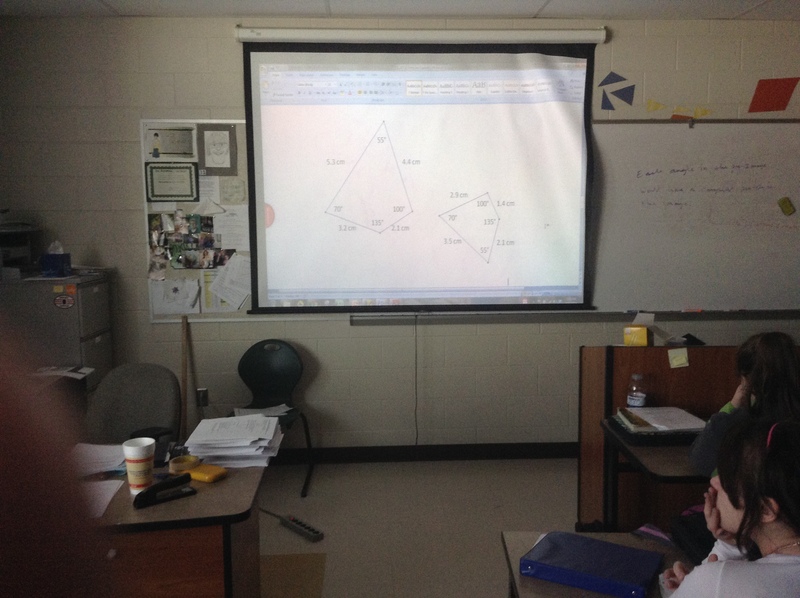 Three sides paired up means the triangles are congruent. What are we risking by avoiding the formal SSS proof? 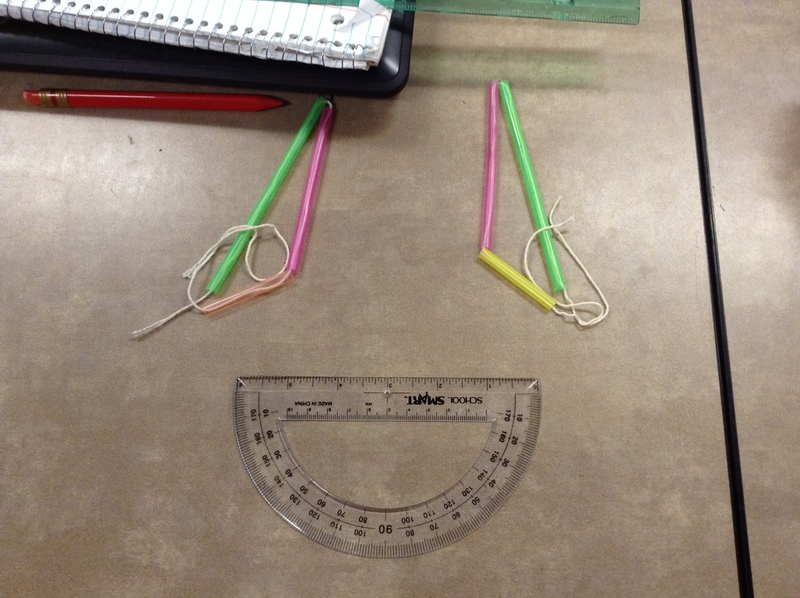 Do we risk giving the impression that straws and string are formal mathematical tools? But wait… aren’t they? What do we risk by doing the formal SSS proof? Do we risk our precious classroom energy by running them through an exercise there isn’t a lot of authentic need for right now? 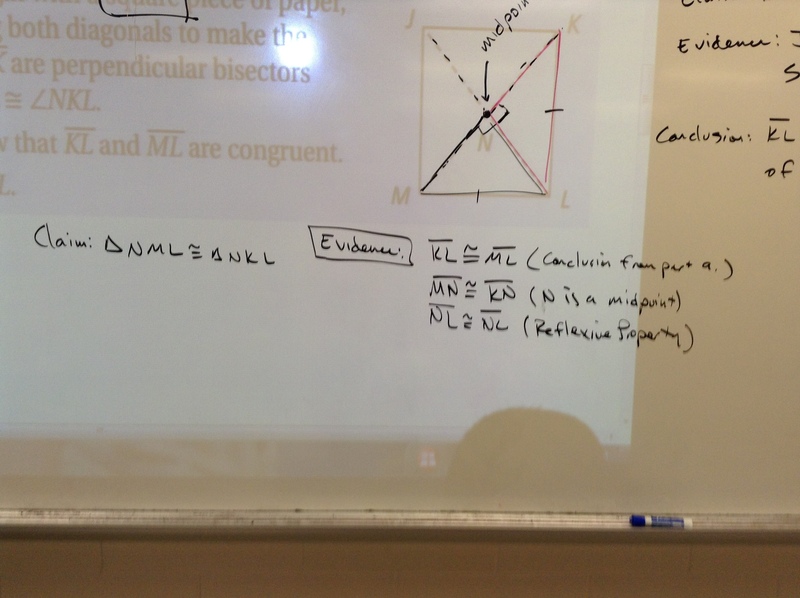 Am I able to say that this is the definite recipe for breathing life into geometry proofs? Not even close. I am sure there are students who are completely uninspired by this. I can say using anecdotal evidence that engagement seems significantly and satisfyingly higher then when we used to run deductive two-column proofs at students from the very beginning. But, we’ll have to see what the consequences are as we keep going.